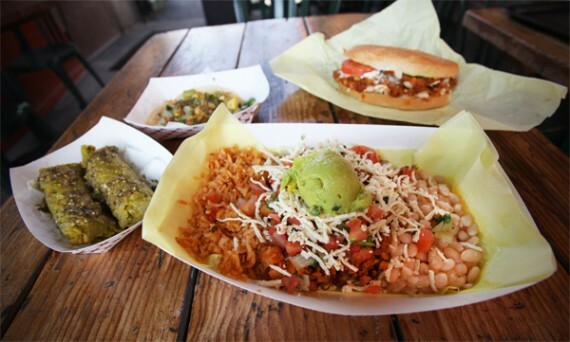 vegan at hamburger hamlet, discount tacos, pizza: world vegan day around LA! today is world vegan day, and to celebrate, a few places of town are offering up vegan specials! i’ll list the ones i know about, and if i miss anything, please leave it in the comments. hugo’s tacos is offering 20% off select items all day including burritos w/ soy chorizo or mixed vegetables, green tamales plain or w/ mixed veg topping or soy chorizo, salad, and frozato. two boots in echo park has launched a new v for vegan pizza, which comes with daiya cheese, artichokes, shiitakes, red onions, and basil & red pepper pesto. most surprisingly of all, hamburger hamlet is unveiling two new vegan options today: a portobello mushroom burger with all the fixins, along with ratatouille and basmati rice. so, game plan: breakfast burrito at hugo’s tacos, lunch at hamburger hamlet, pizza for dinner at two boots. let me know if i’m missing anything.